The sweet scent of freshly cooked Vietnamese waffles tempt many a passer-by to make that quick purchase of this popular street-side food. The dish is always prepared as close to the dusty sidewalk as possible. The creamy mix of milk, sugar and flour is poured carefully into the mould. There are various patterns - simple squares, flowers or hearts. Cooked over a charcoal fire until one side is done, then a quick flip of the iron moulds makes sure the other side is well-done too. The final outcome is irresitible! -browned and crispy outside but soft and sweet inside. Ho Chi Minh City has an array of incredible food but to taste the authentic cuisine, you've got to hit the streets. There is a no-name hole-in-the-wall noodle shop that sells the yummiest noodles in town. Ignore the fact that the plaster is peeling from the walls, the wheeled cart hasn't been wheeled out for years and the floor is shiny with grease and grime. A fresh sprig of spring onions can somehow freshen up the place. Do note however that there are only two tables during the day (at night they pull out a few more so you get the cool winds and pavement view). This means this popular place gets packed quickly unless you come early. The noodles seem to be handmade so instead of the rubbery, plasticky texture we're used to, its soft yet firm and has a taste all of its own. But the highlights are the pork-filled wontons. These Chinese gnocchi are made of thin skins of rolled out flour filled with finely ground minced, flavoured with a tasty mix of spices. The secret is where these wontons are kept. In the drawers of the cart! We caught the chef preparing the wontons one day. I suspect the musky drawers added to the flavour of these delightful wontons. The wonderful wontons are plopped into prepared bowls and then given a nice toss in the broth. I have never seen them throw out the rich broth - what a waste that would be. Thus i suspect this broth has been boiling for.. er.. very long time! No wonder the flavour of the stock is smooth like fine wine. 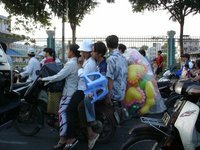 There are only a few large shopping centres in Ho Chi Minh City which have dedicated parking areas for the bikes. Here you see a double storey parking lot for bikes. You can make out the second level if you peer real closely in the centre of the pix. A ramp allows you to drive your bike up to the upper level. Stop at the main entrance to ensure the parking attendants take note of your license plate number and have your receipt stapled onto your handlebars. For small stores - park at the open bike parking lots labelled "Giu Xe" (literally "Keep bike") or if they allow you, park right in front of the store. Most employees park their bike inside the stores (just like some residents park their bikes in their living room - usually the only room in their home!). 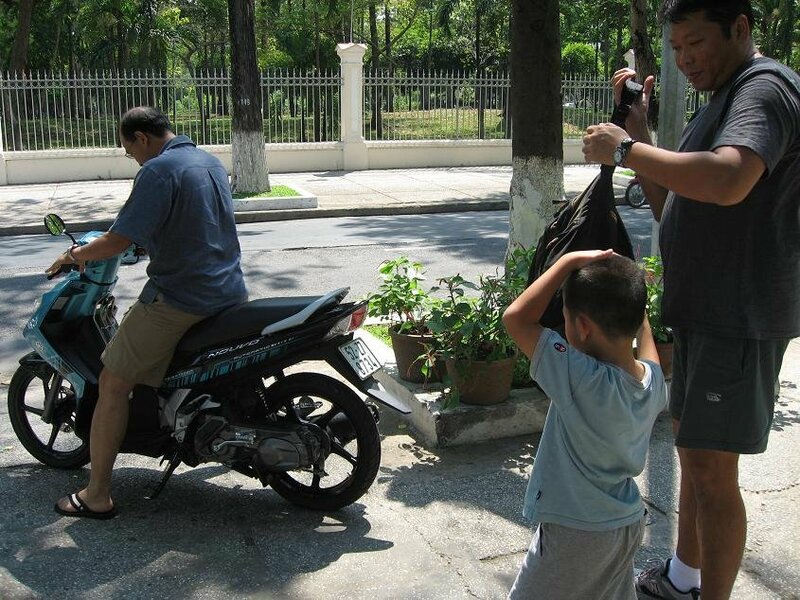 Once you're done with your shopping, stuff the goods in the boot... oops, i mean the seat of your bike... oops, so small ah! Never mind you can also tie up the rest and place them on the hooks at the front of the bike. Make sure the goods are placed properly or else you might lose your balance. Don't just zoom off. Pay for parking and make sure they check you've taken the right bike out. 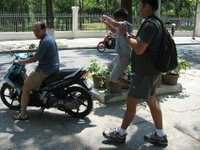 Fees for parking is between 2,000 VND (S$0.20)or 5,000 VND (S$0.50)(usually in town or expensive spots like the Hyatt) per entry. At the open lots, your bike is chalked with your ticket number. 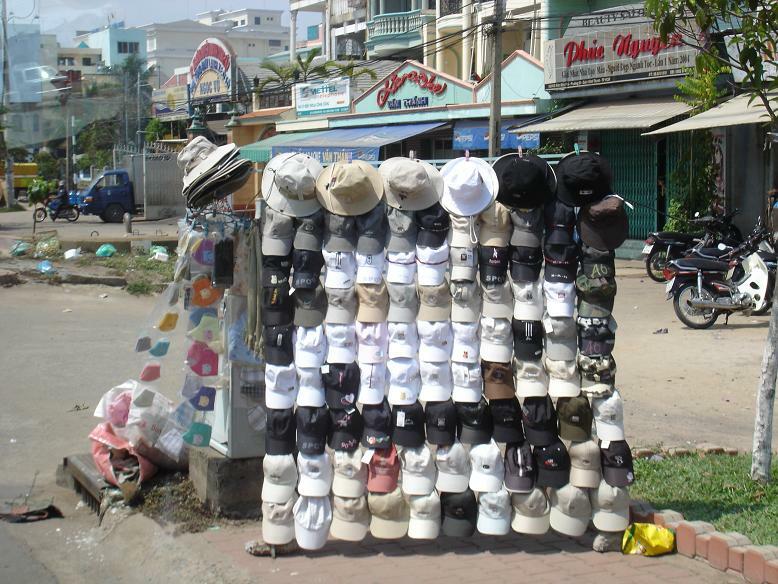 The locals have their shopping balanced to a tee! They even manage to pack in a child or two ... ! Things whizz by rather quickly when you're on a bike. But the colours and flavours of the city still make quite an impression. Here are views of the recent* Tet decorations with traditional red buntings lining the streets. 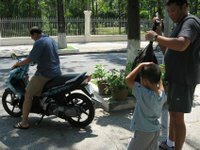 We even caught sight of Uncle Ho conducting the traffic like it was some sort of orchestra. What a riotous melody we made. As its the year of the pig, naturally piggies had to line the streets. Just park your bike in front of a pig and get your shot done. Then hop on again. No worries - its the normal thing to do. 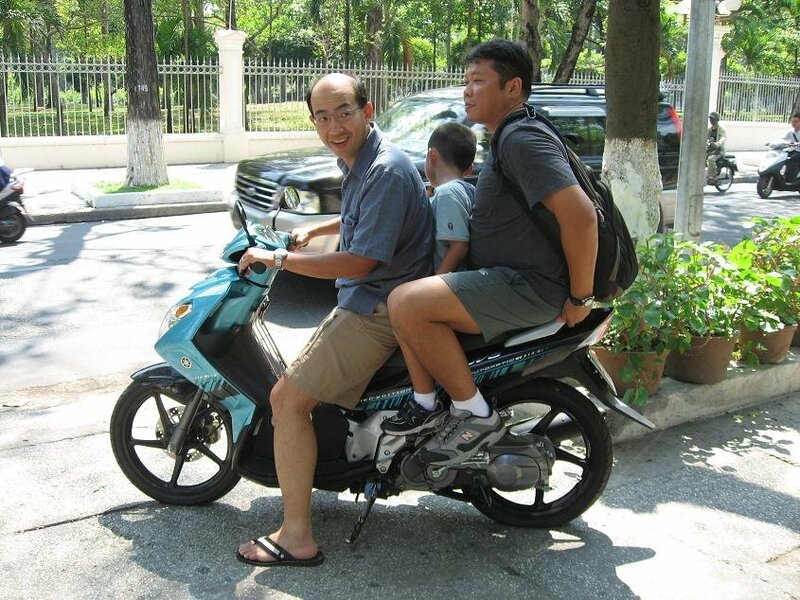 Generally, at the parks, you can drive your bike right up to a comfortable seat, or just sit under the shade of a cool tree and relax (or make-out - as most young Vietnamese would be found doing in the evenings). *Ok so this is a late post - at least i got it out whilst its still the year of the pig! 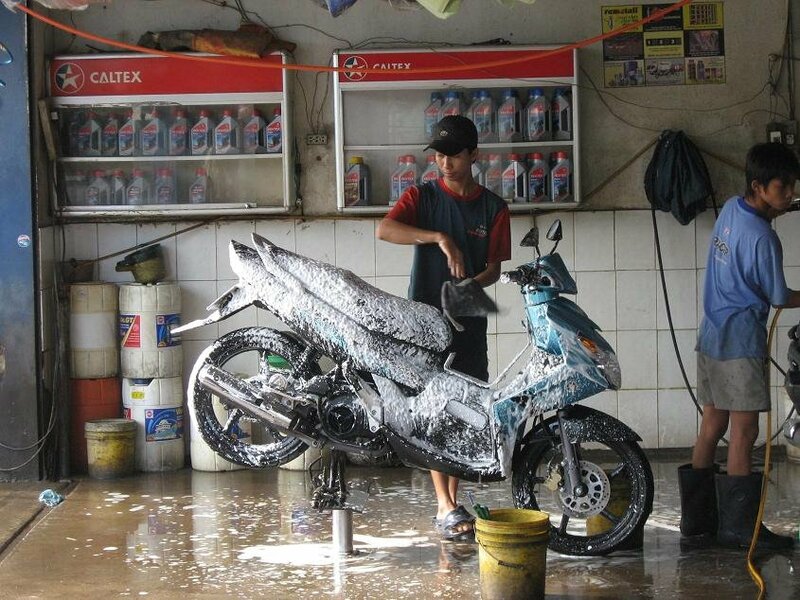 (a) street cafes that double up as motorbike cleaning agencies. 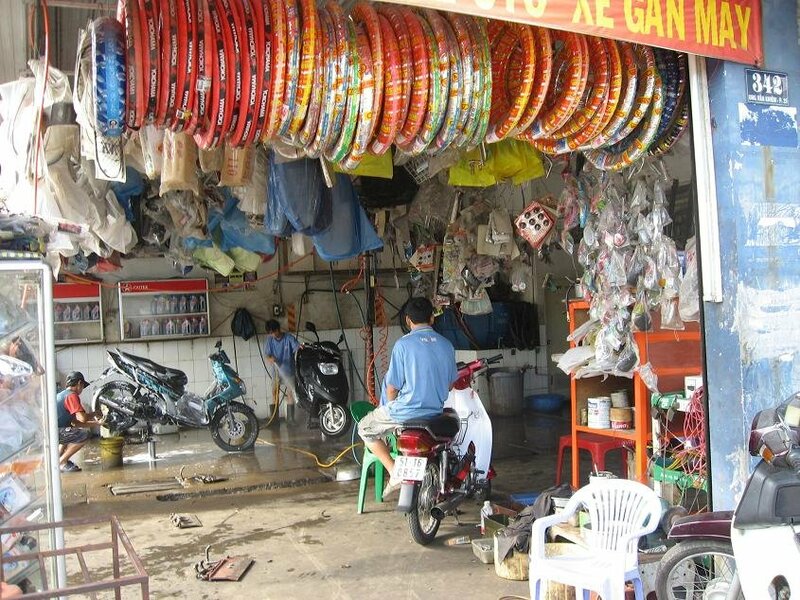 The bikes are handcleaned whilst you sip a cup of Vietnamese coffee. Some can even do minor fixes. Here's option (b) in detail. 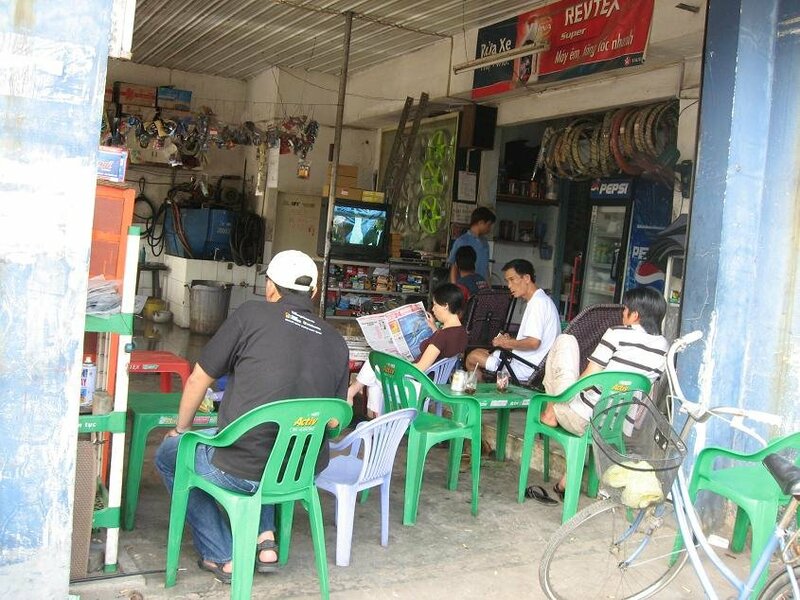 STEP 1: Get to the motorbike drive-in. 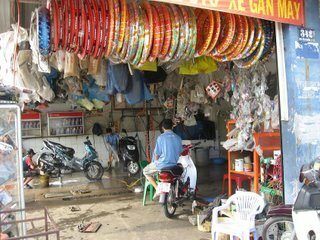 You can spot these by the number of tyres hanging from the ceiling and the really wet floor. 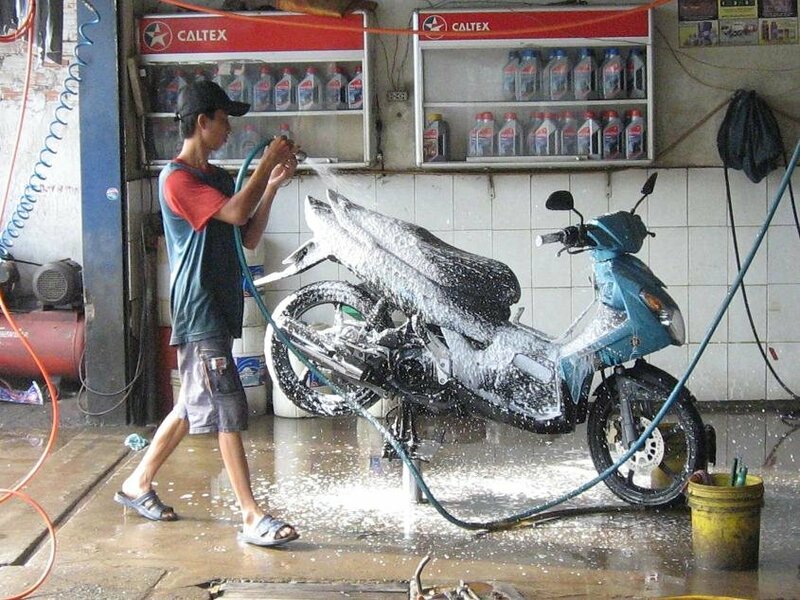 Of course there should be evidence of clean bikes around. STEP 2: Dismount. Some of us used to driving cars may forget and may get rather wet. STEP 3: The bike is jacked up and shown in all its elegance. Basically it also helps to get to the grotty bits especially under the wheels. 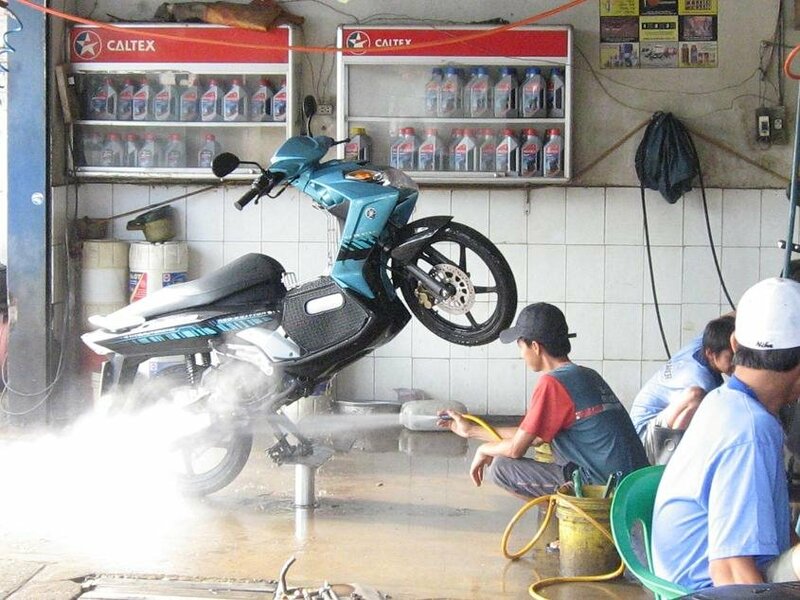 STEP 4: A superjet flushes out dust, dirt, pebbles, chewing gum and dead rats stuck to parts of the bike. STEP 6: A good rub down is given with some kind of gucky rag. 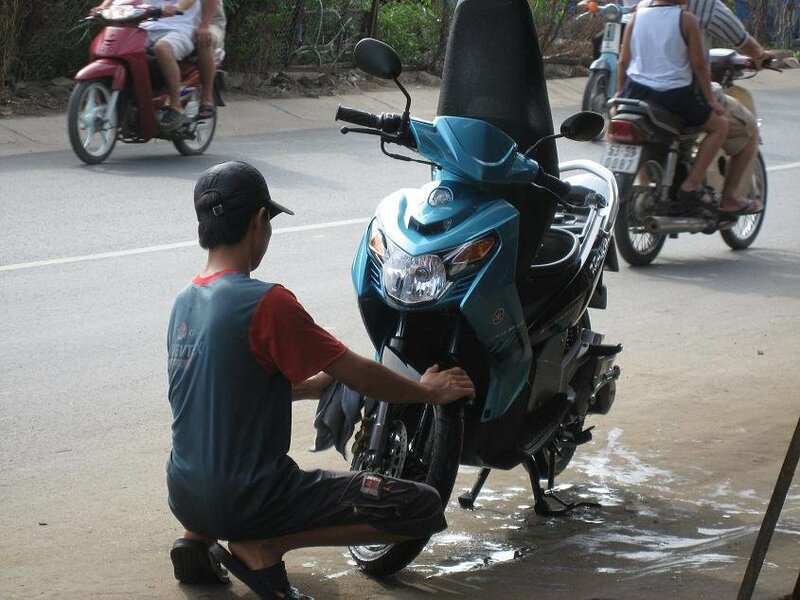 Somehow, the guckier the rag, the shinier the bike. Maybe the gucky rag has this ability in picking up dirt and never leaving anything behind. 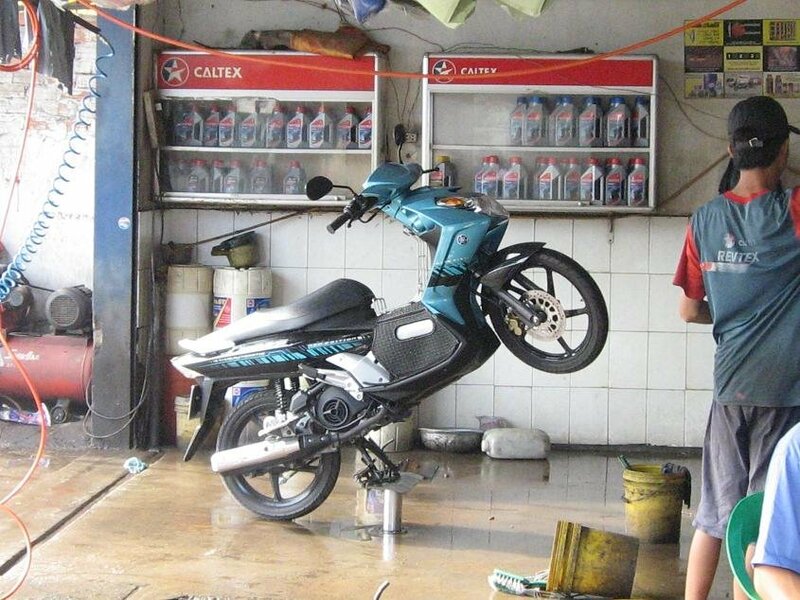 Only in Vietnam is this possible. STEP 7: Finally, the bike is dried out usually by the street (so it can catch more dust). Everything should be fine and dandy unless you suddenly remembered that you forgot to take your precious electronic gadgets out of your now rather wet seat storage! 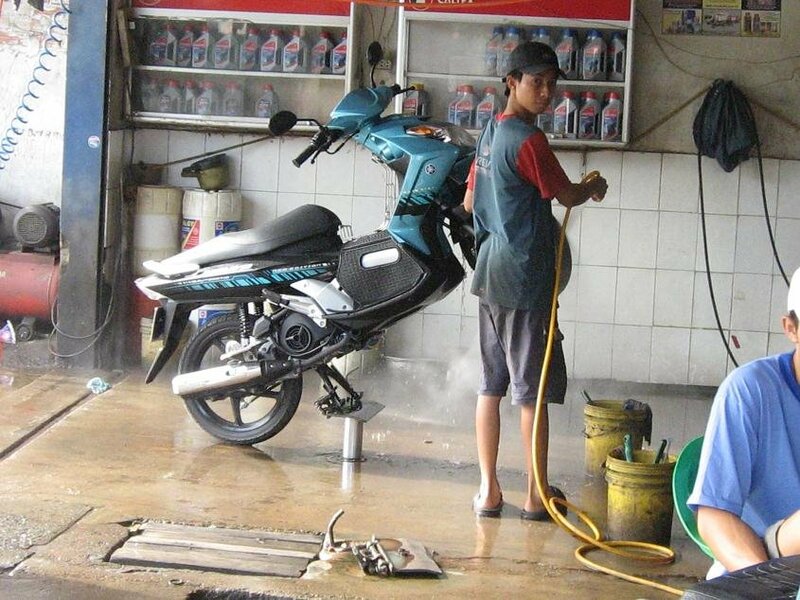 STEP 8: The bike's so clean you can do what every regular Vietnamese loves doing after lunch. 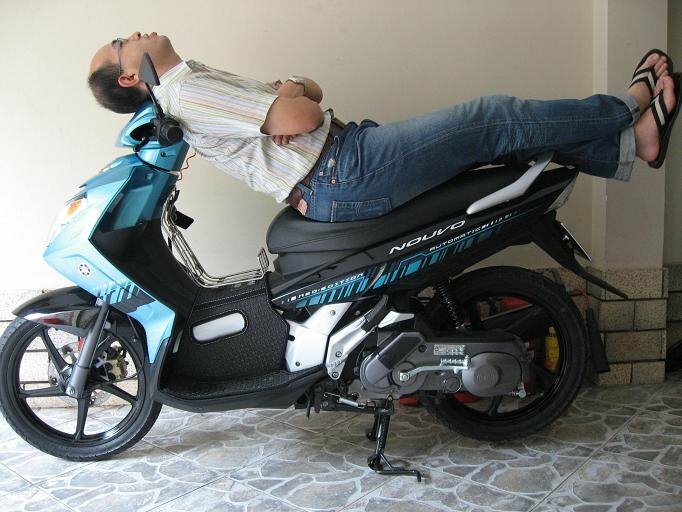 Have a siesta on your bike! Going on a bike ride isn't as simple as it seems. 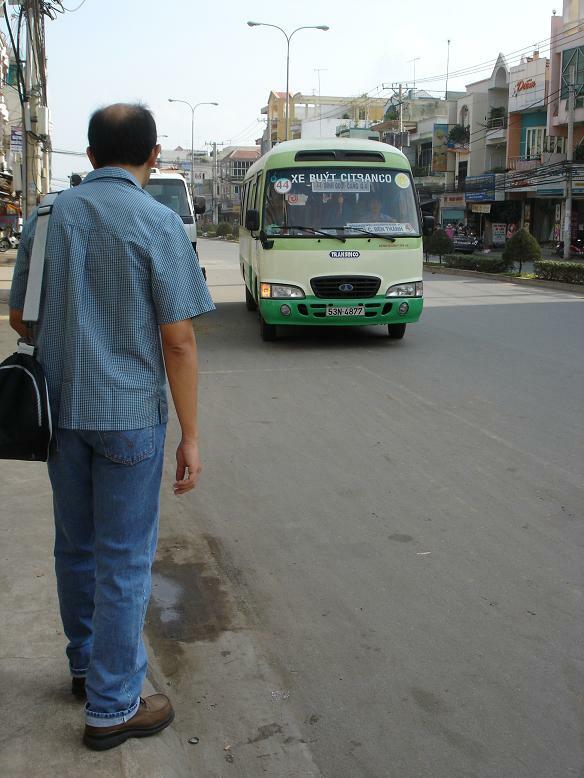 (1) The first step begins with the driver steadying himself. 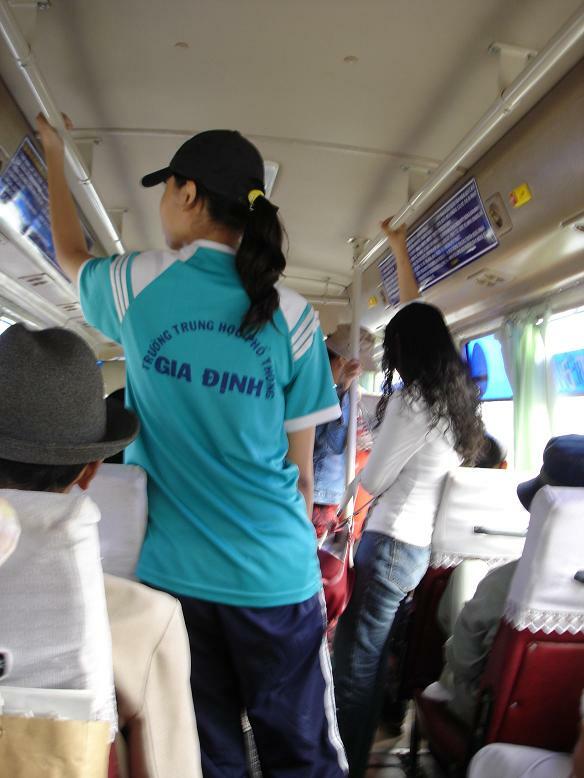 Potential passengers have to also ready themselves - pack the bag, carry other heavy "luggage" into proper position etc. (2) The second step is preparing to sit on the back seat - or whatever is left of it after all necessary luggage is balanced appropriately. A typical tai-tai will have her husband's driver ferry her around town. However, our daily commute to the city began on the humble public bus service. 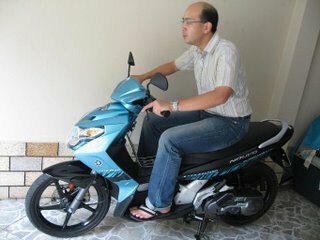 These cost 2,000 VND a ride into town (about S$0.20) but recently increased by 50% (3,000 VND). However, perks included aircondition sure to keep you "cool", a conductor who'll help you up the moving bus and down, the still moving bus so that motorbikes don't cut you down whilst you alight, and the bus driver's personal television set playing favourite Korean soaps in full Vietnamese monologue. 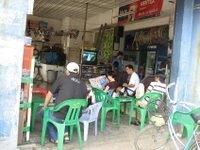 Otherwise entertainment was a simple news broadcast or the top 10 Vietnam hits played in the background. More often though, the chit-chat of friendly commuters transformed strangers to long time friends on the eventful bus journeys. Old ladies and small children always had seats - the conductor would make sure you gave up your seat for them. 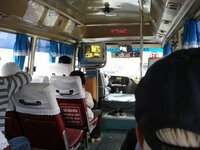 On the bigger buses, vendors would board the bus and begin their sales pitch then lay out their wares (usually nice long-sleeved men's shirt) on the head of each seat for passengers to consider a possible purchase. 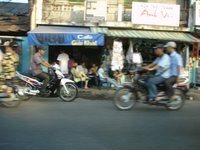 In Vietnam, the red light means you can continue going as long as you don't see a policeman at the junction. The green light means, continue going but make sure you look left and right incase those beating the red light happen to cross your path and there are no orange lights! 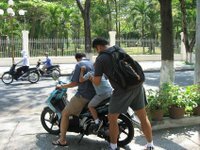 Every street is a two-way street including the pavement and those which are labeled "One Way"
A biker must be appropriately dressed when travelling about town. 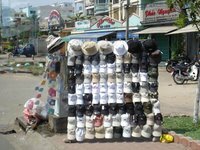 Firstly, to prevent the dust and grime of Saigon's street from affecting one's breathing passage - remember to put a on a mask. There are many varieties to choose from - the kids have cartoon versions, babies have a netting and adults can choose from all styles including the all encompassing veiled look that covers your hair too! 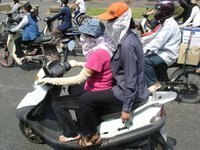 Women make sure their arms are covered with either a jacket or long gloves. Dark glasses keep the sun and dust out but googles do the same for the night. Finally a cap or hat to make sure the look is complete. Incase you've forgotten something - no worries. 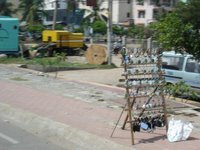 Stalls along the street offer everything from caps to side mirrors.